The guitarist - who has collaborated with The Who's frontman Roger Daltrey for a new collection of songs - is likely to be at number two in the album chart at the weekend. The pair's album, Going Back Home, will be denied the number one spot by X Factor winner Sam Bailey which is already almost 7,000 copies ahead, according to midweek sales figures from the Official Charts Company. Wilko, who announced early last year that he had pancreatic cancer and has refused chemotherapy, enjoyed a number one album with his former band Dr Feelgood in 1976. After leaving, he recorded with Ian Dury And The Blockheads - performing on their Laughter album - but releases with his own band have failed to chart. 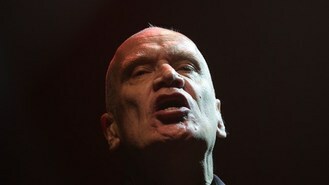 Wilko is famous for his "chopping" style of playing, in which he plays both rhythm and lead guitar, and, unusually, he taught himself to play a right-handed instrument, despite being left-handed. The musician - who played a farewell tour more than a year ago - also became a familiar face to fans of TV hit Game Of Thrones after taking a role in the show. Sam is expected to hang on to her lead and top the chart on Sunday with her covers album The Power Of Love.